I am loving those 2009 red Burgundies! I wish I could say - "If there ever was a time to get into red Burgundy, it's the 2009 vintage" - it's one of those rare vintages that I believe will appeal to both old world and new world wine lovers. It has the fruit, the approachability, and the richness that California wine lovers seek, but the coolness (13-13.5% alc), acid, and nuance that old world palates demand. The only wrinkle - it's as expensive as ever. Even though entry-level bottlings can be had for $20, wines of any stature require at least $40-50, and up. Way up! All that said, every wine penny I have saved, I am tempted to put into the 2009 red Burgs. Last vintage this good was 2005, and I wish I had bought more. Delicious now, and I bet these 2009's will improve with time and be more amazing later. But wait! I hear the 2010 is even better (but more "classic"?, i.e. not as rich). So I have to save some $$ for that too. Oh, the dilemma! Also, look for great deals on the 2008's - a pretty good vintage for both reds and whites - which may be getting dumped on the market at great discounts due to all the frenzy around 2009 and soon 2010. In a month, La Paulee is coming to San Francisco, and the Grand Tasting will be all about 2009 Burgundy. At $300 entry, I still think it's a deal, considering the wines that will be poured. For anyone serious about Burgundy, good luck trying to get in. Note: for more info on La Paulee, see my post on the La Paulee 2010. 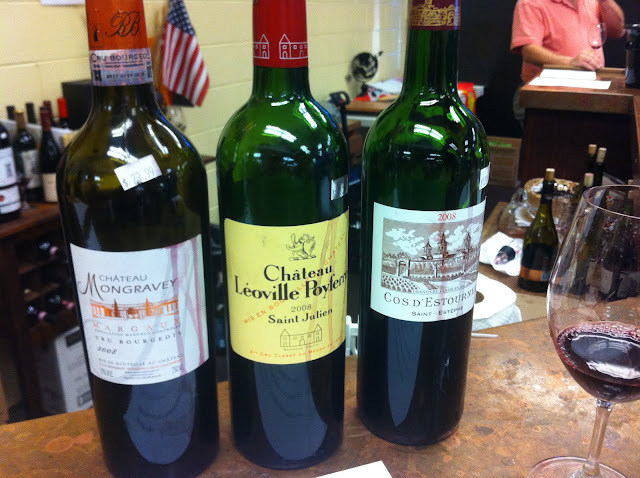 I had an opportunity to taste some 2008 Bordeaux this weekend. ...generally I didn't enjoy any of the 2008's. Very tight and ungiving, many with greenish character, tons of smoky wood and soapy spice, dark black fruits, extremely tannic and masculine at this point. I will come back to them in a year or two for further judgment. Now, a year later, after tasting this weekend, I am starting to become enthusiastic about this vintage, especially because there are great deals to be had, while the glorified 2009 and 2010 vintages are taking up the majority of critics' and consumers' attention. While retailers are dumping the 2008's at half the price of the next two vintages, I recommend you take a closer look. They are starting to open up, and reveal classical and balanced profiles of Bordeaux, at relatively low alcohol (13.5% range), and good aging potential, perhaps not as deep as 2005 and not as ripe and flamboyant as 2009. Two 2nd Growths from Medoc that I tasted - 2008 Chateau Leoville Poyferre (St Julien) and 2008 Chateau Cos D'Estournel (St. Estephe) both were attractive, with Poyferre dense, tightly-wound, and showing more restraint, and the famous "super-second" D'Estournel a bit sweet and new-worldly for my palate (making me think of Opus One and Dominus), but tasty. The best value was a little known Cru Bourgeois from Margaux- 2008 Chateau Mongravey - at under $30, very enjoyable and ready-to-drink Bordeaux.